How are you? It’s about about three weeks now since you were launched, and I was there right at the start. Actually, I was there right before the start, too, helping to plant some of the seeds and hoping you would find some roots. You have! It’s been pretty amazing to watch you grow as more and more people add ideas and connections. Today is Friday, which is a Find Friday idea that Anna came up with to connect those of us in you with more of us in you — sort of like a Spider’s Web of connective threads. Today, Anna asks us to consider asking some questions about you, and I figured, who better to ask, MOOC my friend, than you? Is there demographic diversity in the MOOC? It may be my own impressions, but participants seem to be mostly white Americans. This is a topic that I wonder about as a facilitator of you, most of all, because it forces us to examine our invitational messages, our openness, and our outreach into diverse communities. We want more voices and more perspectives. This question does not mean what you are is not rich with experience and with creativity because, well, just take a look, and you’ll see that it is. It’s amazing. Still, how can/could we have expanded the possibilities even further and could we have done more to help bring in more cultural diversity, MOOC? Is it OK that much of the activity seems chaotic? I suspect you don’t mind, MOOC, since you thrive on decentralized activities but I wonder if some people are turned off by the way each Make Cycle unfolds in a flurry of activity? While we try to make clear that people can enter at any time, I wonder if that is the message newcomers get from the activity. MOOC, if you were to stumble upon yourself right now — in the third Make Cycle — what would you think? Would you feel invited to participate? How can we better encourage folks to break off into smaller, interest-driven groups? We seem to cluster around each other in large groups, in a positive way, and yet, one of the hopes, MOOC, is that folks would begin to see others with similar passions and similar interests, and create pathways to connect. Is there something more we can do/should have done to set the stage for that kind of small group setting? What will happen, MOOC, when the last Make Cycle comes to a close in early August? Will the energy of you keep the ideas alive so that the “making” and “connecting” will filter into classroom experiences? Ultimately, that’s why we put you in motion, MOOC, for people this summer. First, to give folks time to play. Second, to encourage all of us to consider implications for learning environments. So, MOOC, there you are — a few questions on my mind. Be sure to write back, won’t you? Until I hear from you, happy making and joyful connecting, and always remain open and collaborative in spirit and in deeds! PS — the image above was created with the Newspaper Clipping site. Give it a try, MOOC, and make your own news. This entry was posted in CLMOOC and tagged #clmooc, #f5f. Bookmark the permalink. 1. As has been said, you need to put the food down where the goats can get to it. Community organizers get down to the neighborhood level and perhaps the MOOC can, too. I think that this might start with wider diversity in the facilitator class. And maybe the facilitators need to be more like community organizers put the food down where a more diverse goat population can find it. 2. You have to gather somewhere. G+ is a space we do not own. Heck, even ordinary folk can’t buy Google stock IPO’s when they come out. And Google is, in the end, an advertising seller and reseller using us in excahnge for the tools they want to provide. There are open tools and I think we need to consider them for the next time. The big problem is creating content and using new tools at the same time. Maybe the MOOC needs to be smaller, maybe the community needs more skin in the game. 3. The fact is that the number of brave folks willing to enter into the game of personal transformation in even a small way will not ever be very large until some tipping point or flash point is reached. Connected learning as a coherent theory is still one on the outside looking in so I think it cannot help but seem…chaotic. Connecting is a game played on many levels and it is an infinite game, one that can and should be played to our dying days. Theory is difficult to internalize when it is hard to find a field to practice in. This MOOC has been such a field, a t-ball field. Like t-ball it seems chaos. Some kid hits the ball and every other kid descends on it, regardless of the inefficiency. The point is this–we are still playing the game and it takes time to learn your position and respect others positions. 4. It all starts with reciprocation and patience. The MOOC itself should tell us something about this lesson. The creators of the MOOC took over a month to bring this together. And we are pretty competent connected learners. We are still learning how to facilitate and probably have not done enough work at the ‘neighborhood’ level to help folks coalesce. We are doing lots of other MOOC activities, but I think we have been too busy with Hangouts and twitterchats and newsletters and the stuff that concerns the theory of connected learning. We haven’t gotten down where our people are to actively invite and provide specific spaces for that or suggest specific spaces for that. I think it might be time to do more of that, but the remit we have may be too large for us as a group. I think we need another level of facilitator who can help specifically with this. This is not a criticism of what has been constructed and what has been done. I am proud of the MOOC. Ours is a model for others to follow and to improve upon. Patience and reflection in the middle of the chaos is the order of the day. 5. I believe that professional change is possible. I believe that personal change is possible. I believe transformational change happens when enough folks change personally and professionally. How many will MOOC manage to have helped change? Will that change be carried down off the mountain? Maybe only the use of a certain tool will come from this. Perhaps one principle will be internalized and brought back. Who knows, if a value like equity or full participation or social connectedness makes its way in some active practical sense then we have begun well at the end. We are trying to change the ecology of learning to one where we have way fewer takers and more givers . That is a big deal with big pushback. All I can beg for is patience, the rhizomatic, connected learning world won’t be built in a day. I suspect that we will come to understand the story of Moses and the promised land utterly. Terry channeling the MOOC is a thing of beauty. Diversity in Moocs is an interesting question. Certainly in the massive xmoocs offered by Coursera et al. you see an enormous amount of diversity. But I agree there is less diversity within the cmooc environment. When I think and reflect on my own journey within the cmooc environment it has been based on relationships. Why am I here? Because of relationships. I have been in other online communities with Joe Dillon, Sheri Edwards, Chad Sansings, you and probably others within this group. So I am comfortable within this space. I am much more likely to be productive with this group because it is a safe maker space. I am here because I want to explore connected learning and making. I think if you surveyed people you would find they came to clmooc through a relationship with someone else. So is the size of your mooc dependent on your planning committee’s PLN? However, these types of communities can end up becoming cliques, potentially reinforcing ideas of what is “good” making because there are a lack of differing viewpoints within the community. This was something that was touched upon briefly in etmooc but not really discussed in depth. How much is language a barrier for instance? What about the time zones when activities are scheduled? How much of this activity dependent on the makers’ access to making and sharing tools? And do members of other cultures view making and sharing in the same way? A great question for discussion. Hey MOOC what’s up with you? 1. On the question of diversity and how to have a more welcoming environment to folk like me? (Mexican American educator with a cultural and language background different from fellow MOOC participants) Interesting I didn’t really see you in that way. I felt welcomed and my participation was validated by the facilitators and fellow participants. One step would be for folk like me to reach out to our F2F network and motivate them to jump in. My school is predominately hispanic teachers. My district is reaching that tipping point also. Nevertheless in a district of 30,000+ teachers I don’t see any LAUSD folk. In a numbers game we are still part of the first wave. 2. I did notice the discussion on using proprietary spaces and tools. I guess free isn’t really free. Google + and other web based services make you more accessible. That is something I can appreciate. At the same time I would feel comfortable jumping in to open source tools. The only problem is, I don’t think our networks can go outside the firewall that Google and other monsters have created. I probably would have never heard of you at my school in a different way. 3. Yep you are a bit caotic. But that is just fine with me. There are plenty of great examples to follow and the energy is contagious. At the same time the facilitators have made it a down to Earth environment where it is ok to make mistakes. If I was jumping in right now. I would feel fine just trying one activity. That’s why I like the C as in collaboration and not course of class. 4. I think we like to stay close to the mothership. In this case it’s the activity going on at Google + with the weekly makes, the google hangouts, and the twitter chats. When we look at active participants maybe this is ok. I mean 500+ checked in. I would guess that most are not participating. Let’s say there are about 100 lurking. ( I may be one of those). and let’s say 50 are participating in all the activities. Don’t quote me on the numbers I just feeling it out. So 10 percent kind of hard to make small groups but it can be done. It needs to be member or participant initiated. 5. When you come to a close and we all start thinking of going back to our classrooms and schools. I will take you back with me mooc. You become part of my experience and I am adding a bunch of new tools and skills. I will make connections with fellow educators and build my network. I will try these makes with my students. I will model how it is to be part of something bigger than our own classroom and school. Thanks MOOC you are cool! Teaching, as a profession. embodies your concern about diversity. I think “school success” – as a system of externally reinforced norms and biases – would also do well to ask itself your questions. I don’t have an answer, but I’m confident that if we can help teachers of any sort leave experiences like this willing to open up their classrooms to student inquiry and creation, then in a generation or two moocs that mirror teacher demographics will have more diversity than ours does. Google does a lot of what we wanted to do in planning and launching the Mooc. It provides a landing place and a launch pad. How do we help one another launch from it to open tools? To Thimbles and #toyhacks and OER repositories and student-made classrooms? Maybe by doing what we’re doing with just a bit more encouragement for one another to share each make in at least one open place, too. I’m actually struck by how many of us attempt each make and share the results publicly. You don’t seem chaotic to me, but, then again, the Internet is my Evernote. To create smaller affinity groups I think we follow Karen into supporting F2F groups/events like maker parties, and we try different ways to encourage more collaboration: project pitches, reading groups, radio #clmooc, more unofficial make-with-me hangouts – lots to try. See what sticks. Go go go. What will happen? Who knows. I hope each of us leaves prepared to see just a little more of the space we can inhabit and in which we can play, even in very traditional and formal learning spaces. I hope each of us leaves expecting to learn how to teach our kids from observing them at play. You’ll be fine. You are okay! 2. I am traditionally not google+-centric at all. Initially, I posted in multiple places, but I grew impatient trying to post in all of the different places to reach everyone each time. Google+ seemed to be the most active spot, so I started to focus my efforts there. 3. I am fine with chaotic! 4. I think the effort you made in the first week for us to each pick a “Friday Five,” people who had influenced us in the #clmooc, was a good move in this direction. 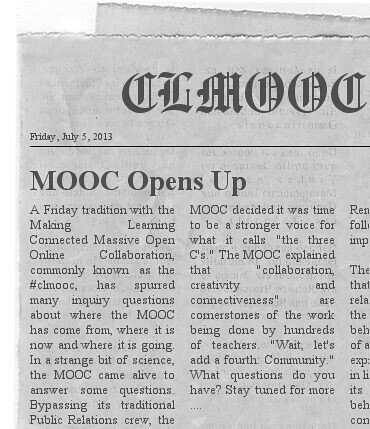 Unfortunately the #clmooc does not naturally lead to breaking off into smaller groups. One online class I took did a randomized division of members into “teams” which we used for more close interaction, which allowed us to get to know that smaller group of people better. Would there a way to do something like that? I realize it would be better if it were interest-driven, but I have found everyone here interesting, and could see myself interacting with them more closely. 5. I will most definitely take this “Make” energy into my classroom. I have learned a lot and have been inspired by so many of you. I’m just going to address a couple of questions. I haven’t been terribly active so far, for various life-getting-busy reasons, but have tried to do so here and there. First, I want to say something about the G+ question. G+ can be good in many ways, but I have problems with it in that if there are lots of posts then things can get lost easily and it’s somewhat hard to find them. I don’t know of any other tool that solves that problem, though! So far as I can tell, one can’t search just in one group, but has to search all of G+? And if people aren’t using hashtags in the same way, then that hampers the search option. I also prefer to interact with people on their blogs rather than through G+, because I feel like I can get to know more about them that way, by reading their other posts, and I’m connecting with them in a place where they may be active after the course is done. Some may continue to be active on G+, but others won’t. I only use G+ for the courses I’m in that use it, and otherwise post stuff on my blog. there is a blog hub for clmooc, but it is not emphasized as something everyone should connect to or read, and we aren’t encouraged to go to people’s blogs and comment. More, we seem encouraged to go to G+ and comment. But then the only people that see those comments are those on G+, not people reading our blogs who aren’t in the course. And, like others, I’d prefer some less proprietary, less advertising-focused, less data-gathering-focused option if it’s possible. I know of some people who won’t join a MOOC if it uses G+, or won’t use the G+ part of it. Finally, you ask about whether people who show up now will feel welcome. I think so. I drop in and out here and there, and feel welcomed by the fact that I get comments on my posts on G+ right away, and the weekly emails are really open and encouraging about any level of participation you want to do. I don’t know about completely starting off new at this point, and looking at the website. I guess I’d feel a bit like I was behind just b/c it’s clear lots has gone on before. And visiting the G+ site is overwhelming at this point, so if I were new I might freak out a bit about that. But being a veteran MOOC person it doesn’t bug me b/c I know I don’t have to read everything! Just being as clear as possible on the main site that anyone is welcome at any time, with any level of participation, is probably the most important thing! Thank you all for leaving comments and thoughts, and ideas to reflect upon as we hit our mid-MOOC stride. This question about chaos is interesting. I love chaos, choice and abundance. Do not know if people do fear or avoid chaos. Chaos is said to provoke creativity, so lets make chaos bloom. On a computer screen a MOOC is not as chaotic as it is for someone who wants to get an overview. On a computer screen all is coming one by one, so the chaos is less. All people participating in this and other moocs seem to cope with this chaos very good. Maybe someone will ask when the mooc is over all participants some questions about chaos as a gift or as a danger. Great points, and I think it comes down to perspective and experience.